The East Room of the White House was transformed into an intimate blues club for a concert featuring blues all-stars of the past, present and future - and the President himself. The surprise performance by Mr Obama came at the end of the playlist when the blues ensemble was singing Sweet Home Chicago, the blues anthem of Mr Obama's home town. Buddy Guy prodded the President, saying he had heard that the president sang part of an Al Green tune recently, and adding: "You gotta keep it up." 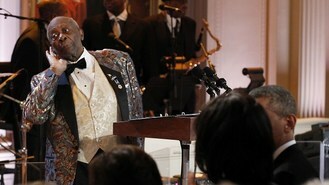 Then Jagger handed over the mic, and Mr Obama seemed compelled to comply. "Come on, baby don't you want to go," the president sang out twice, handing off the mic to BB King momentarily, and then taking it back to tack on Sweet Home Chicago at the end. King, 86, arrived in a wheelchair but rose tall to kick off the night with a raucous Let the Good Times Roll, quickly joined by other members of the ensemble. And he followed with The Thrill is Gone. Jeff Beck slowed things down with an instrumental Brush With the Blues, as anticipation built for the arrival of Jagger, who did not disappoint. The long-time Rolling Stones frontman delivered on I Can't Turn You Loose and then teamed up with Beck on Commit a Crime. Jagger got the President and his wife up out of their seats, swaying and clapping to the music, and picked up the pace with Miss You, performed with Shemekia Copeland and Susan Tedeschi.